HaiSoft Review 2019: Is HaiSoft a Good Hosting? Established in January 2001, HaiSoft is a French web hosting provider that offers a complete range of shared hosting solutions to companies and individuals. They provide specialist outsourcing of virtual servers, dedicated servers, cloud computing solutions, and cloud appliances. HaiSoft is a French web hosting provider that does specialist outsourcing of virtual servers, dedicated servers, cloud computing, and cloud appliances. Founded in 2001, they also provide a complete range of shared hosting services to companies and individuals not only in France but also in other countries such as the Republic of Congo, Israel, the United Kingdom, and Cote d’Ivoire. The HaiSoft website can be switched between the French and English languages. HaiSoft fully manages the administration and maintenance of their servers including monitoring, updates, and security. Their server outsourcing services come with installation and configuration of popular applications according to their clients’ requirements. They support database import, Java, PHP, or even the implementation of Cron jobs. What’s more, the hosting solutions are backed up by a team of specialists who provide clients with real-time advice and customized support at no extra cost. The R1Soft backup package comes with free daily backups in the form of incremental backups that provide a high backup frequency while maintaining high server performance. HaiSoft also offers SiteLock security (with malware protection) and three types of SSL certificates in partnership with Comodo and StartSSL. All shared hosting plans use web-based control panels such as cPanel and Plesk that have simple, intuitive, and user-friendly interfaces. HaiSoft’s hosting plans are competitively priced and can be tailor-made to suit the specific needs of an individual user. What’s more, their hosting plans include advanced features that streamline web hosting for small websites (like personal blogs) all the way up to big websites with sophisticated databases and high traffic (like e-commerce websites). Although HaiSoft’s hosting solutions are available to customers in many countries around the world, the prices are listed only in euros, so non-European customers will have to account for the exchange rate when purchasing these plans. Unfortunately, there is no free trial period and no refund policy, but there is a promise of 99.5% uptime backed by a compensation plan, and you can get a free .fr domain with any shared hosting plan. 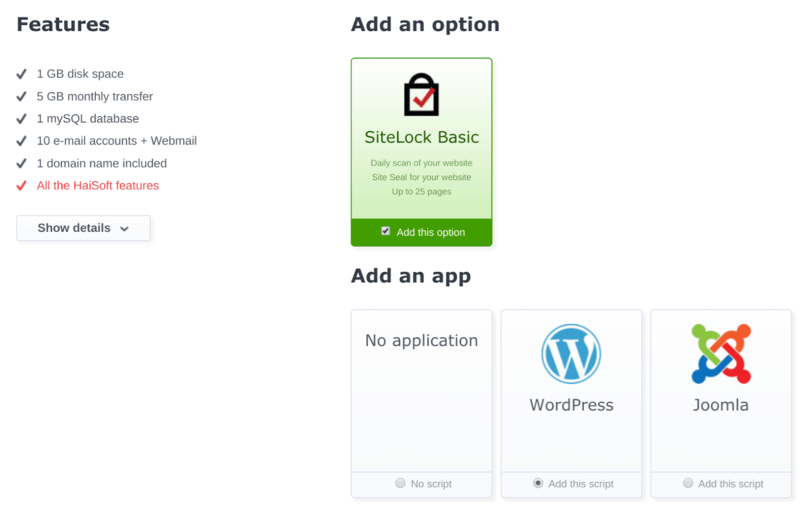 At the checkout, you can customize your package by adding options (such as SiteLock) and apps (such as WordPress, Joomla, and others). HaiSoft’s competent customer support team can be contacted 24/7 by telephone or email, or by submitting a support ticket in the members’ area. Their website also has a contact form that’s reserved for commercial and pre-sales technical questions, plus live chat which (sadly) always seems to be offline. They don’t offer much in terms of a knowledge base. Powered by servers near Orléans and Paris in France, HaiSoft delivers excellent website hosting solutions to small and medium-sized businesses in France and several other countries around the world. 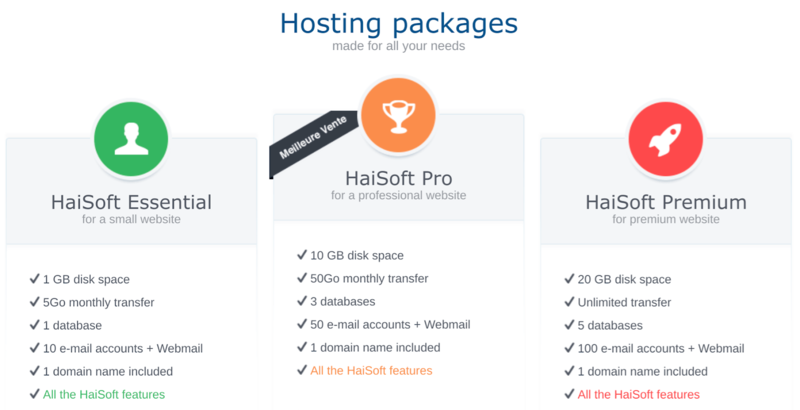 Wondering how HaiSoft stacks up against other Web Hosting companies? Enter any other Web Hosting company and we will give you a side-by-side comparison.